Supposedly that includes Medicare B, D, Supplement, dental insurance, hearing, & vision, as well as out-of-pocket for: doctor, hospital, tests, prescriptions, dental. That's from Dana Anspach's 2016 book "Control your retirement destiny", 2nd Ed., p. 290. Anspach got those numbers from a apps.hvsfinancial.com/hvadvisor (which is not accessible to me, so I can't use it to find numbers for other ages, etc.). Anybody have better numbers to use? I don't have a concern with those numbers. But consider how much variation there will be, and then combine health with travel and perhaps other discretionary items. What I did was look at what a max out of pocket number might be, and assume that anything less would be added to the travel budget. You might also think about costs for long term care, should you need it. Nursing homes are very expensive. We are a retired couple, ages 84 and 77 at the end of 2017. I can give you our costs. COMMENTS: I purchased a Medicare Advantage plan (Anthem BC/BS for me only in 2014.. My wife remained with Medicare and Medigap until 2016 when she also purchased a Humana Advantage plan.) You can see the resulting lower insurance costs starting in 2014, They are saving us over $4000 per year. Uninsured dentist expenses are much higher than 10 years ago. Hearing aids (uninsured) for me started in 2011. I have purchased two (in 2011 and 2013) at a cost of over $2000 each. Replacement aids were purchased in 2017, but all covered by my Advantage Plan. Most of our medications had been generic until 2016 when my wife had to purchase 2 expensive name brands. A while back on bogleheads, there was discussion of a 2017 paper also published on the hvsfinancial website. I don't know if it has the same information as what appears to be an app that you reference above, but it has quite a bit of information. (First post in the boglehead's thread has a link to the actual paper.) I seem to recall that this thread had its fair share of people commenting who had obviously never read the paper, so let the reader beware. Retiree health care costs vary from person to person. • Health status and risk. Ages 82 and 77 here. While our details are a bit different, the totals are not far off. We have Medicare plus Medigap plans F and N. Biggest differences would be hearing aids (need or not), and dental work (crowns or not) and special prescriptions. Those factors are pretty individual. Last edited by 2015 on Fri Oct 19, 2018 11:35 am, edited 1 time in total. Thank you, Sheepdog. It's really helpful to see a real-life example, with real expenses. It’s great that you included dental, hearing and vision. The variations, and the reasons for the variations, is also very helpful to see. I take it that "total out of pocket" includes both insurance premiums and costs that are not paid by insurance? Last edited by NoHeat on Thu Oct 18, 2018 12:49 pm, edited 2 times in total. Our model suggests that a medium-risk 65-year-old woman living in a median-cost area, using only traditional Medicare with Part D, could expect to pay between about $3,200 and $6,600 for premiums and out-of-pocket medical, dental, and vision costs in 2018 (Figure 1). At the median, she could expect to pay about $3,900. 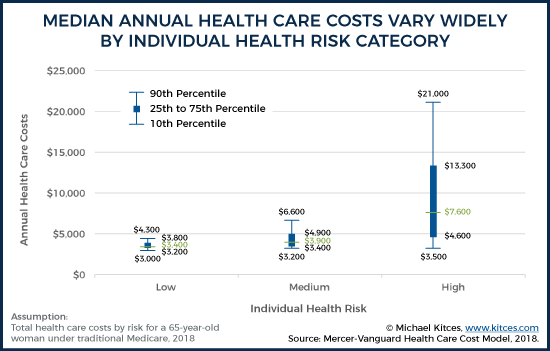 ... On the other hand, a high-risk individual would expect costs to be over 90% higher, with the possibility that expenses in some years would exceed five times the medium-risk baseline. There are three data points, for three risk levels. It’s unclear to me whether hearing and vision are included in those costs for a 65-year-old — I’m guessing most women of that age do not yet have hearing expenses. My wife and I are both on a Kaiser Medicare plan. We each pay $134 for Medicare part B and $30/month to Kaiser. in 2019, our primary care office visit copay is actually going down from $20 to $10, while we will pay more to Kaiser in 2019 ($36 per month) and more to part B ($135.50). Our plan includes the drug benefit. Our Kaiser plan includes (for $20 copay) Optometrist visit and refractions for current/update for glasses prescriptions. Depending on all the details, a Medicare Advantage plan can be more cost effective than Original Medicare plus supplement plus Part D. Most, but not all, Advantage plans include drugs. In 2019 our plan will also include gym access through Silver Fit. Our plan also includes a small discount on dental care from participating dentists.